We love our UV press and you will too! Neyenesch Printers is approaching the three year anniversary of the installation of our Heidelberg, eight color, UV cured, perfecting press. Our clients could not be happier with the results of UV printing over conventional offset. Green is good! Conventional offset printing presses use solvent based inks which release volatile organic compounds (VOCs) into the atmosphere as they dry. VOC’s contribute to air pollution, smog and greenhouse gases. As they print, UV cured inks are exposed to ultra-violet lights and dry immediately with very little evaporation of solvents. Since the installation of our UV press we have seen a dramatic reduction in our VOC release. A comparison of the month of January 2014 to January of 2017 shows a drop from 1749 to 278 (reported to the CA- EPA), an impressive 84% reduction in our carbon footprint, and yours! New technology on our UV press also reduces our daily use of hazardous cleaning solvents and fountain solution. We have reduced our hazardous waste disposal by 83% (reported to the CA-EPA). Sure, UV printing reduces your carbon footprint but there are so many other benefits! Instant drying inks cure on the surface and are not absorbed into paper allowing for color reproduction and saturation that is out of this world! This is especially apparent when printing on an uncoated, matte or dull coated paper. Hard drying UV inks are less likely to scuff, rub or offset. This eliminates the need to add aqueous coating to your printed piece thus allowing the surface of your non-print area to be coating free. If you’re paying for a quality grade of paper, why cover it with coating? Not printing on paper? Plastic, vinyl, foil and other synthetic materials will not absorb ink thus creating a drying challenge for conventional inks. Fast drying, UV cured inks are your best solution for these applications. Your time is valuable and deadlines are tight! UV cured inks and a perfecting press are here to help. 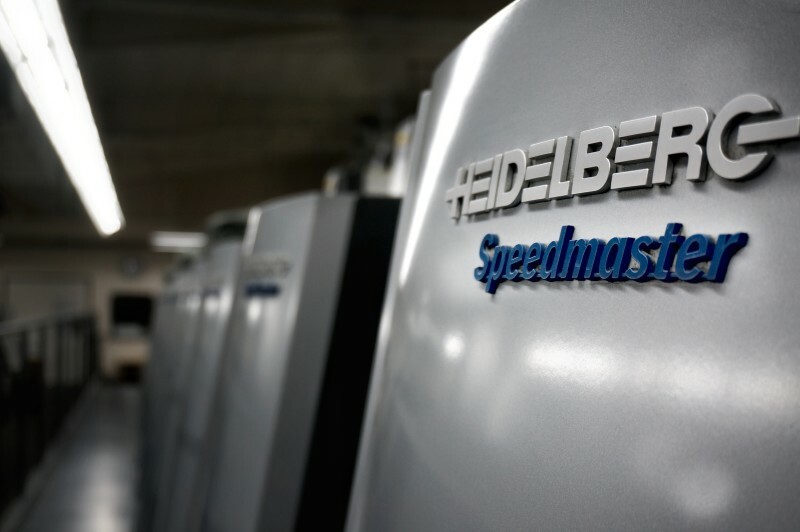 Our eight color, perfecting press prints both sides of the sheet in a single pass, cutting the number of press checks and run times in half. As a G-7 Master Printer certified company, we will have a beautiful sheet on the easel for you in no time and you’ll be back at the studio working on your next masterpiece. With zero dry time required on most substrates, we’ll be off press and ready to bind without delay. Add a little bling! Our UV press offers many specialty coating options. Full UV coat your covers, spot UV coat your product images or use a reticulating varnish to add texture and dimension. These are just a few of the coating options available with UV printing. Neyenesch Printers is proud of our leadership in the southern California printing market. We look forward to a future of supporting our clients, our community and a continued #committmenttoprint.